ASUCR held their second meeting of the fall quarter at 6:35 p.m. last Wednesday, Oct.10. The Senate discussed the appointment of a new BCOE senator and the selection of a new Elections Director for ASUCR this year. During public forum Justin Domecillo, a fourth-year English major, mentioned a bylaws workshop covering its first chapter, for the benefit of ASUCR staff and senators. The session was held in the Humanities building on Thursday, Oct. 11. The meeting proceeded with committee reports, beginning with President Pro Tempore Julian Gonzalez listing off his choices for the Legislative Review Committee members: CHASS senator Avi Idea as vice president, CHASS senator Alyssa Tocker, CHASS senator Asia Ou, CHASS senator Chelsea Davenport, CNAS senator Abigail Cortes and CNAS senator Kenneth Vongdi. Vongdi was admitted to the vacant CNAS seat that ASUCR chose to fill last week. Gonzalez then requested that all legislation for the committee meeting be turned in to all committee members 48 hours in advance (on Friday) for adequate review before in-meeting deliberation. He added that each senator needed to submit at least one piece of legislation before winter quarter. Gonzalez then mentioned the resolution of President Semi Cole’s “student voter registration initiative,” which had been passed the day before. After the meeting, he requested that Executive Vice President Andrea Cuevas discuss the resolution with Chancellor Kim Wilcox the following Friday to refine the initiative and magnify its effects. A vote to approve the current staff of External Affairs followed, which resulted in the selection of fourth-year political science major Annel Lopez as chief of staff, fourth-year public policy major Daniel Castaneda as civic engagement director, third-year political science major Javier Ramos as incumbent community director, and third-year transfer and political science major Jordanna Wong as executive assistant. The vote of approval passed unanimously 12-0-0. 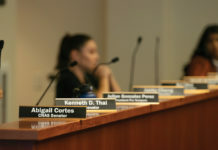 The senate then turned its attention to the approval of a BCOE senator position, intended to be filled by Jonathan Thai, a third-year computer science major. After a brief introduction, Thai was admitted to the position unanimously with a vote of 12-0-0 and took his seat at the horseshoe shortly after. 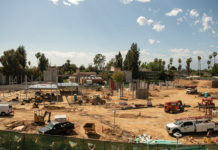 The final item of new business was the election of a new elections director for ASUCR, of which there were three candidates: fourth-year political science major Quan Nguyen, Domecillo and fourth-year economics major Laura Pullen. Nguyen emphasized that social media has huge potential in increasing student turnout, aiming to realize the potential in part with “visually stunning ads to invigorate students to vote” and using social media to “publicize future candidates with infographics and recorded interviews.” He also stated that the “grievances” that students have with ASUCR “stem from wrong facts and misunderstandings of what ASUCR is and is not capable of doing” and wanted to rectify such by making ASUCR’s actions more transparent and available, such as the votes it carries out on Wednesdays. Domecillo addressed the “incompatibility” that Costo Hall-affiliated students feel with ASUCR, stating that he could help relieve that tension since he “represents a portion of Costo Hall as a Referendum Student Advisory Committee (RSAC) member” and as elections director could become a direct line for the Hall to contact ASUCR. 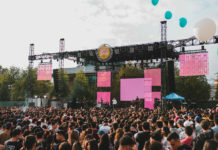 In general, Domecillo aimed to have all types of students and student groups on campus to be heard by ASUCR this year, something UCR administrators started to handle last year. The last candidate at the podium was Pullen. She addressed several “key action points,” one of which was that the elections process could be enhanced. She intended to achieve this by creating “fun and informative programs” on campus that encourage students to vote, as well as by reactivating ASUCR’s Instagram account to improve visibility and audience outreach. She also considered the advertisement of election matters on the TVs throughout the campus dorms, gym and other buildings in order to spread the word about voting even further. Pullen also wanted to increase ASUCR’s activity with its various committees. One committee she wanted to work with more was the Student Voice Committee (SVC). To figure out why students did not vote last year, she would request that the SVC send out a survey regarding the issue and use the results to increase voter turnout this year. She also planned to work with ASUCR’s Marketing Committee and create an elections video to further increase the chances of sufficient student voters. After Pullen finished she and all visitors were asked to leave the room for a closed election on who would be the next elections director. With a vote of 9-0-4, Pullen was voted as the new elections director for this year. As the new elections director Pullen has taken her first steps in the position by “drafting the 2018-2019 elections timeline and revising the election bylaws that includes (sic) outdated political party and laptopping language.” She’s also aiming to create a “motivated and hard-working Elections Committee team” and will send out applications during the week of Oct. 14.” Pullen is undecided on whether voting will be done online or on paper ballots, and also expects discussion on laptopping to be held in the future. The meeting was adjourned at 7:52 p.m. ASUCR meets every Wednesday at 6:30 p.m. in HUB 221, the Senate Chambers.